Big news today. 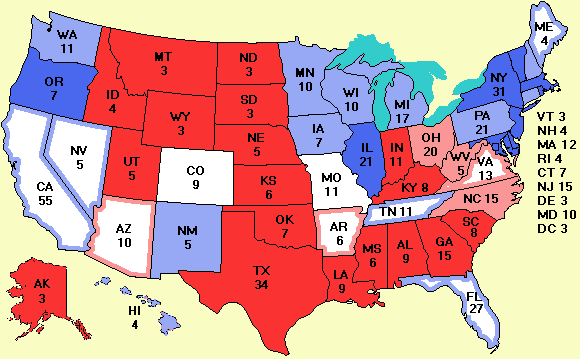 Zogby has released polls in 16 battleground states. As usual, it is possible to find some good news for each side. For Bush, the good news is that he is ahead in Ohio by about twice the margin of error. Ohio is an absolutely must-win state for him. If he loses Ohio, it is almost certainly back to the ranch for him. But he is now ahead there 51% to 46% with a MoE of 2.6%. He also has a solid 8% lead in West Virgina, despite the job losses there. Two very welcome pieces of news. The problem is that all the rest of the news is bad. Kerry is ahead in the other 14 states, sometimes only by a hair, but still ahead. Kerry is even statistically tied in Arkansas, Tennessee, and Virginia. That is not supposed to happen. If Bush has to fight for the northern South, it will drain money away from Ohio, Florida, and Missouri. The Zogby poll for Missouri puts Kerry at 49.3% and Bush at 48.8%, but since I am not keeping track of tenths of a percent, I'll call that a tie. Close enough for government work. Polls from other pollsters in Arkansas, Illinois, Texas, and Virginia don't change much. It looks like Bush is going into the RNC far behind. Zogby puts the score in the electoral college at 324 for Kerry and 214 for Bush, even worse than EVP's score. But next week belongs to George Bush. Actually, one other poll has good news for Bush--Laura Bush. She is much more popular than Teresa Heinz Kerry. The Articles and books page has been updated to include more books and display the book covers. Most are critical of the administration, but some support it. Surprisingly some of the harshest criticism comes from unimpeachably conservative sources. For example, Pat Buchanan's latest book, Where the Right Went Wrong lambasts Bush for abandoning core conservative principles such as limited government and balanced budgets. More problems with voting machines. I fear a huge disaster when machines representing 2000 votes go on the blink in a state somebody has won by 1000 votes. And recounts are not possible with the current voting machines. They should all be banned until they work, maybe in 2008. They are simply not ready for prime time this year. A reader made an interesting suggestion today: advertising the site in college newspapers. I would greatly appreciate readers in Florida, Ohio, Missouri, and other big swing states checking out if the larger colleges take print ads, and if so how much they cost for various sizes. If the papers have websites, the URLs would be useful too. Thanks. Today we have another new feature: a daily movie . It is being produced and directed by Matt Massie. Thank you Matt! It will always run one day behind the polling data. For example, today's movie does not contain today's data because Matt didn't have it when he made the movie yesterday. It will be accessible from the More data menu item. There has been so much demand for information about the Senate races, that I made a new page to track the Senate races It, too, is reachable from the More data menu item. Finally, a belated acknowledgement to R.J. Parsons for all the help he gave me with Excel. For the readers who have been here since May 24, you know how much the Excel spreadsheet has improved since then--more columns, colors, automation, and more. Thanks!